The Dry Wash Cave Ruins are located in the Abajo Mountains area of the Manti-LaSal National Forest about 14 miles north of Blanding, Utah. The ruins are located in caves or alcoves at an elevation that is over 7900 feet above sea level making them some of the highest ruins in the area. At that altitude you would probably think of the location as a summer home but the cliffs are south facing so who knows. From Blanding, Utah you can follow one of the signs for the Nizhoni Campground or head north on 100E in the center of town. The 100E street becomes the Blue Mountain Road. Continue north for 11-12 miles. By the time you are in the Manti-LaSal National Forest the road turns to gravel. 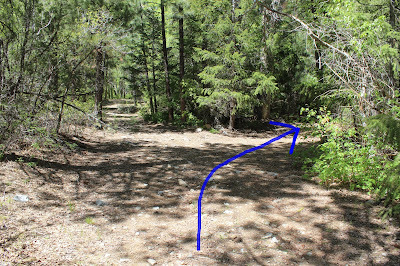 Eventually you will come to a fork in the road with the right fork leading over to the Nizhoni Campground. 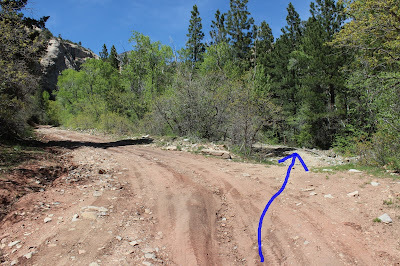 Take the left fork and follow it for another 1.3 miles to the Dry Wash Road 5385. The entire drive from Blanding can be made in a passenger car during dry weather if you don't mind the gravel road. Also note that various maps give different names for some of these roads like FR 5385 might show up as FR 385. If you look north from the trailhead you can see the caves where the ruins are. This is actually the only place along the trail where you can see the ruin in the cave on the left. Once you get to the end of the trail the cave is obscured by the lower part of the mountain. From the trailhead follow the road as it climbs gently up the Dry Wash drainage. After a little over a quarter mile leave the main road to the right. In less than 200 yards take the right fork again. The road gets much rockier and has a few steep sections. Continue to follow the road as it reaches the top of the drainage and turns back sharply to the left. There is another trail that takes off on the right that you can ignore. The trail levels off after the last turn and passes beneath the caves where you will find a bench and kiosk with information about the site. Signs in the area warn against trying to climb up to the ruins. From below you can see that the builders used a lot of wooden poles in their construction not only for roof but also for wall support. At the end of the trail you can see a water pipe that is part of the Town of Blandings waterworks passing through a tunnel in the mountain. This is all of the second cave that can be seen from the trail. It is nice to get up out of the desert to see a ruin in another setting and enjoy some cooler temperatures. This picture is a good view of the trailhead area. The hairpin corner shows up quite well on maps making it easier to see where you are headed. The Nizhoni Campground is a good base camp for much of the area. It has several restrooms with vault toilets and 4 picnic sites that are free. Many of the camping sites like this one are big enough for a good sized trailer. Potable water is also available at several locations and as you can see there are picnic tables and fire grates. There is a fee to stay in the campground but we also noticed several other places where people were camping in open areas while driving up from Blanding that were free. If you would like to see it for yourself then all you have to do is 'Take a hike'.